These days, early in the morning, I pull up the covers over my shoulders as cool air blows in through the open window. Later, the shower nozzle is turned just a little bit more to the warm side. In the morning the dew is heavy on the car windshield. Swish swish go the wipers before I pull out of the driveway. In the morning I turn on my seat heater for the ride to school, but still wear my sunglasses. In the afternoon I turn the air conditioner to full blast. 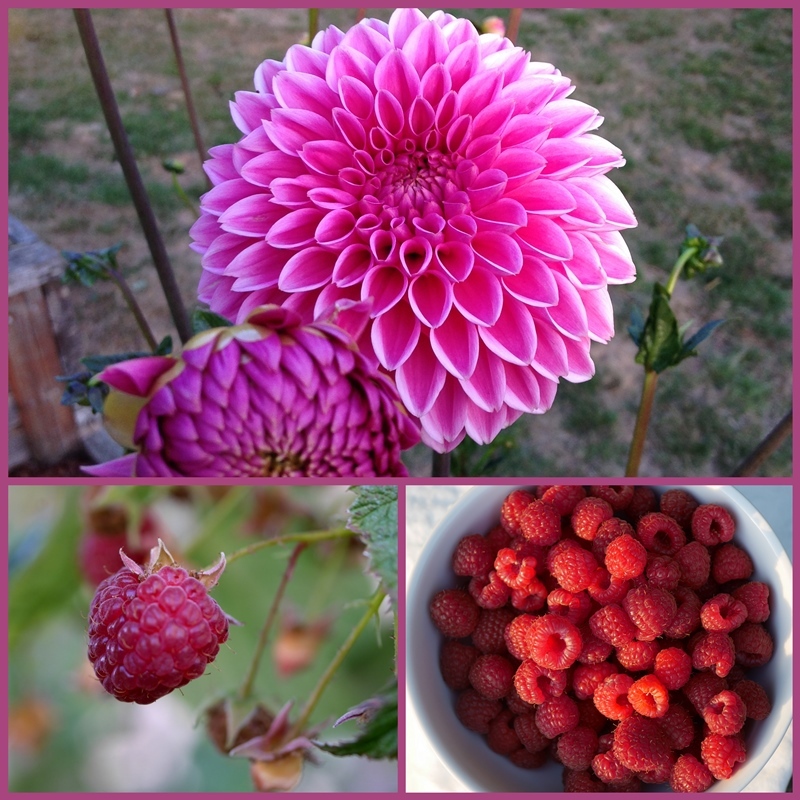 These days, in the evening, when I go out with my white bowl to pick a few raspberries, the light slants low and golden. The dahlias are finally blooming; they've been so slow this year. Tomatoes ripen and burst with improbable sweetness in my mouth. These days Winchester Cathedral blooms once again with creamy petals that fall quickly in the heat of the afternoon. Soon there will be buds on my other rose bushes. These days I remember the times spent with my grandchildren over the summer. There were together times, as well as a Nana date with each one. Mini golf, the petting zoo, go-carts, lunch out, complete with ice cream. Such fun. These days, in the woods and gardens, in contrast to the rich and tawny shades that characterize autumn flowers, the autumn crocus (colchicum autumnale) blooms in pale shades more reminiscent of spring. I think it a bit out of place, like showing up at a serious event - a conference or memorial - in an airy sundress. These days, from a brilliant blue sky, the sun dazzles, burnishing fading foliage with gold. In the evening the drapes are drawn sooner than they were, and lamps are lighted against the darkness. Gone are the days of sitting outdoors while sunfire beats from the west. The melancholy of vanishing summer comes unexpectedly even as I embrace the energy of autumn. These days pears, plums, and apples fill bowls in the kitchen. For a recent dinner party, I made a Pear Frangipane Tarte from a recipe found in the September issue of Victoria magazine. It was a straightforward recipe with a pretty and delicious result. When my brother and his wife visited last weekend, Salted Caramel Pots de Crème from Laura Calder's Paris Express book were on the menu. The recipe made 6, so Tim and I enjoyed the last two on our own. These days, typical of the transition between summer and autumn, are splendid and exquisite. Lauren deStefano says it's the "time when everything bursts with its last beauty, as if nature had been saving up all year for the grand finale." These days...how are they with you? Lorrie - you spoil us with your photos that are at once delicate and complex, and your evocative turn of phrase. Thank you - you send me off to bed with delightful late summer visions dancing in my head. I must admit, I am not feeling any melancholy with approaching autumn … rather, I am looking forward to nights around the fire (out or in), and the opportunity to hunker down with some inside activities … so these days are full of enjoyment of the current moment and anticipation for those to come! 'These days' are varied - some warm - even hot, still holding onto summer, others chilly revealing that autumn is definitely in the air, but today is bright and sunny with baby blue skies, and I love it - it feels as if we may be blessed with an Indian Summer this year. Your Pear Frangipane Tarte and Salted Caramel Pots de Crème both look delicious, and so are your lovely images. These days it is quiet here. I am in awe that it is so quiet in the morning. I've closed the bedroom windows, mostly because my husband is gone hunting and I want to feel more secure while he gone. You have wrapped up you summer. I have one dahlia blooming. Next year I'll plant them early. What will you be teaching this year? Exquisitely described! There is a similarity between your days and mine except I am retired, have no seat heaters (more’s the pity), and am not baking such fine things. You have a grand who has grown very tall over the summer. 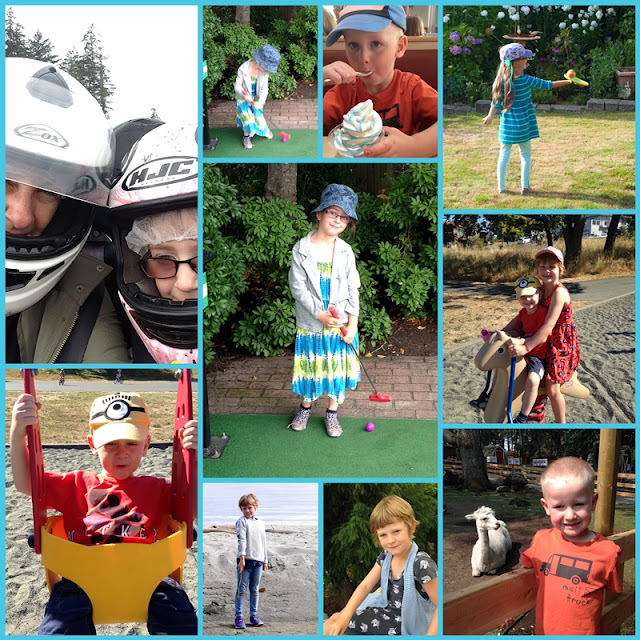 A lovely end of summertime story Lorrie, and the photos are great, especially of the fast growing grandchildren. I miss mine being young and ready to enjoy those childhood games, and the great grands are still too young. These days it seems to be just the two of us. Not bad but very different. Love the frangipane tart - I'm making a similar dessert for the weekend but with plums. Trying to use up food items before leaving on the trip! Yes, summer is definitely on the wane here too and my thoughts are leaning toward a lot of garden chores when we return. At least there will be cooler days to work outside. . . . . . . and of course being able to sleep with windows open at night is always wonderful. Is it sweater weather there yet? A packing list is being written! Ah, these days. So lovely . . . These days here are sultry and the intense heat is wearying, but autumn can't be far off now so there is hope. I love coming here every morning. You describe your life in ways that one wishes to be also a part of. I'm not yet ready to think of Fall. The time is flying by too fast. Beautiful photos. Your tart looks amazing! As always, your photos are beautiful! The little ones are so cute and your food photos inspire me. Lorrie, oh I am jealous of your cooler weather. It is still as hot and humid as ever here. We are due for rain this weekend and I am hoping that it will get cooler. Such beautiful photographs and your dessert looks so professional! Great job! These days, right now anyway, I'm purring like a cat that is being stroked gently just from reading--experiencing--this lovely post. It is so beautifully written, Lorrie! I could feel the changes there in your life. Your own stepping into autumn is much more advanced than my own but I will be watching for these lovely things in a few weeks when autumn advances down to Nashville. Your pear tart is gorgeous! What a joy to visit your blog and enjoy your stunning array of photos and beautifully written commentary. Your wonderful floral and food images are magazine-worthy! Your cute grandkids are lucky to have such a fun grandma. I had my first pumpkin treat yesterday! Creative and well written, described and illustrated with your photos. You are a talented lady! A feast for the eyes and soul! Thanks for the lovely peek into your world as the days grow cooler and shorter. Today it's raining here with gusto, it was +26C yesterday. I feel cool even with a long-sleeved shirt. Been enjoying the floral gifts from my garden (and camera) ... and as I read your latest post, think a nice lavender-earl grey cup of tea would fit the bill. What a nice post. And yes, we've seen quite a few changes this past few days. I haven't mentioned it on my blog yet but we've traveled to the mountains. It's wonderful to have such cool nights and pleasant day time temps. Love your photos of food....I find that a real challenge! Enjoy the weekend! Such a lovely word picture of the changing season! And the tarte looks amazing! Such a lovely post, I really enjoyed seeing your photographs.